Campione del Garda is the only village within Tremosine sul Garda located right on the lake, on a small peninsula at an altitude of 74 meters above sea level - for this reason, it is very popular with lovers of water sports. The name of the village comes from the Latin language and it was first recorded in documents dating back to the twelfth century as ‘Campillione’, meaning "small field" or "arable plain". 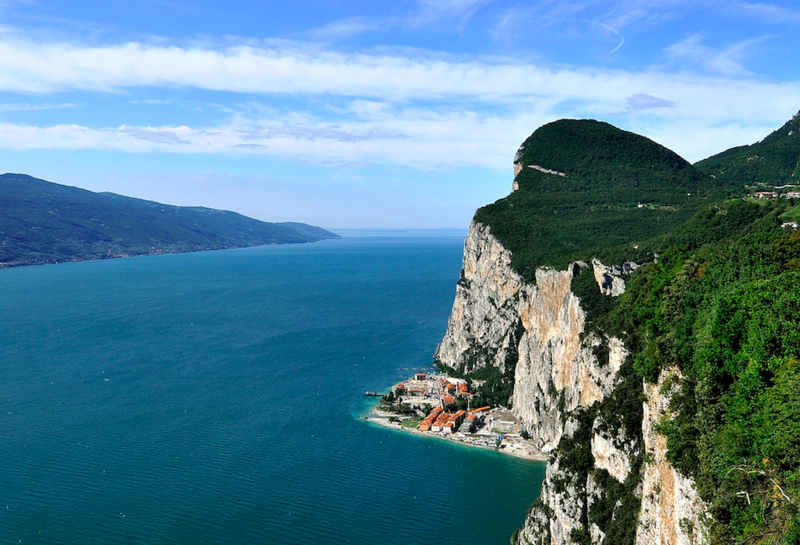 The village is located on the delta of the San Michele stream, in a canyon wedged between rocky cliffs. Campione was inhabited since ancient times. The history of the village is linked to Ercolano, bishop of Brescia, who took refuge in the village in the sixth century to live as a hermit. Nowadays, his body rests in the church in nearby Maderno. Over the centuries, the village experienced phases of rise and decline, depending on the activities that shaped the social and urban settlement of Campione over time. The town was a buzzing industrial centre ever since the 16th century, with several workshops including paper mills, forges and mills, that harnessed the power of the streams precipitating from the upper plateau. In 1700, the rich Archetti merchant family from Brescia bought the workshops, opened a new spinning mill and organized the production. Later they erected a villa in Campione, called "Villa Archetti", and a small church dedicated to Sant'Ercolano, that was demolished in the following century. In 1807, a heavy flood destroyed the ancient workshops, causing businesses to gradually leave Campione, which then remained almost uninhabited for about a century. It was only in 1896 that Giangiacomo Feltrinelli, followed by Vittorio Olcese, erected a cotton mill and worker houses in the village, including a church, a theatre, a boarding school and a shop, and families of employers in the new plant moved back to the village. The cotton mill was finally closed in 1981 due to the economic crisis in the Seventies, and from that moment Campione was abandoned again. Recently the village has been experiencing a sort of rebirth, thanks to its redevelopment for tourism purposes. Thanks to its reliable winds, Campione sul Garda is home to national and international sailing, windsurfing and kitesurfing competitions, a sport for which the village is very well known. Campione is also home to several water sports schools, and there’s a beach where it’s possible to swim. Due to its resemblance to a fjord, Campione was chosen as a location for a number of films, including The International. The patron saint’s day is celebrated on August 12th, the day of Saint Ercolano.